The new Serval LWIR uncooled thermal imaging GigE camera from Xenics is designed for industrial in-line process and quality control in harsh and hot industrial environments. It features an IP67 design so that no large additional third-party enclosure is needed. Operating over a wavelength range of 8 to 14 µm the new Serval camera produces images at 640 x 480 pixels and 50 Hz high frame rate. The Gigabit Ethernet interface is fully compatible with the GigE Vision standard for high data transfer rates over distances up to 100 metres. With 75 mK NETD (Noise Equivalent Temperature Difference), high sensitivity for small signals is guaranteed. The compact Serval camera measures just 55 x 55 x 130 mm (depending on lens) and is characterised by its rugged design. The IP-67 design includes a front window protection to allow operation for case temperatures between 0°C to 60°C. The front window protection is provided complete with air purge to avoid the need for expensive cleaning or replacement of the lens. This means maximum operation time even in dust-loaded atmospheres. The design eliminates the need for a large third party enclosure and an extensive thermal calibration. This leads to a cost-effective compact vision system and an early time to market. The camera also offers a variety of configurations with a specific athermalized fixed lens and optional IP67 cabling, sun shroud and I/O interface board. 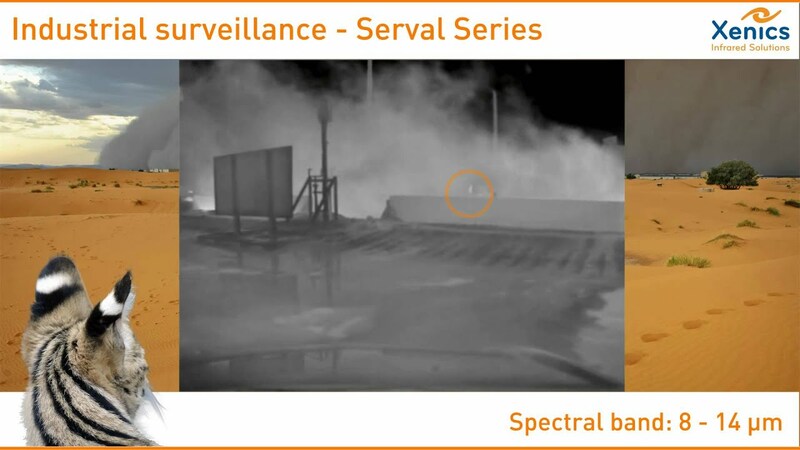 Thermal imaging (LWIR) cameras are widely used in the automotive, food or electronic industries. The new Serval camera is designed for long-term stable and reliable operation under difficult ambient conditions. It therefore provides system integrators in this highly specialized field with a new solution in terms of easy and maintenance-free installations as well as excellent performance. The Xenics Serval-640-GigE is a IP67 LWIR camera rugged to withstand very harsh industrial environments. Xenics is a well-established and rapidly growing European high-tech company producing IR imaging products for the vision market.